The renewal of all things is meant to be the center of our view of the world, our hopes, and our tangible expectations as we plan our lives going forward. The phrase bucket list comes from the expression “kick the bucket,” the day we give it all up. A bucket list means those things we hope to do before we die. Meaning, it’s now or never, baby. Bucket list mentality is very revealing and even more tragic, because it betrays our belief that this life really is our only chance. 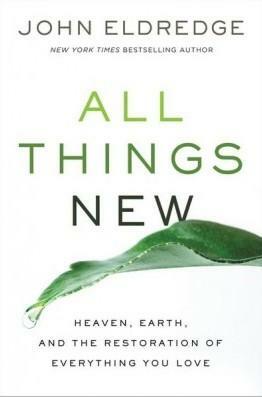 After all—we think the earth is destroyed and we go to the pews in the sky. No wonder the human race grows more desperate in our search for kingdom counterfeits. What is it, my readers, that you hope to hang on to? If you love your athletic condition, surely you realize it cannot go on forever; eventually your body will succumb to age and your performance will diminish every year. Inexorably. If you relish your mind, you understand that your mind will dim with age; even if you dodge the great leveler dementia, you will forget many things, and may eventually have the mental capacity of a small child. And the people you love? You will lose them or they you; your very life is but a passing breeze, “each of us is but a breath” (Psalm 39:5 NLT). The fall and winter of your life will come; they are perhaps upon many of you even now. There is no holding back that winter. You understand, dear friends, that you will say good-bye to everyone you love and everything you hold dear. Our life is a short time in expectation, a time in which sadness and joy kiss each other at every moment. There is a quality of sadness that pervades all the moments of our lives. It seems that there is no such thing as a clear-cut pure joy, but that even in the most happy moments of our existence we sense a tinge of sadness. In every satisfaction, there is an awareness of limitations. In every success, there is the fear of jealousy. Behind every smile, there is a tear. In every embrace, there is loneliness. In every friendship, distance. And in all forms of light, there is the knowledge of surrounding darkness.